This is the second book in the OTRFK series. 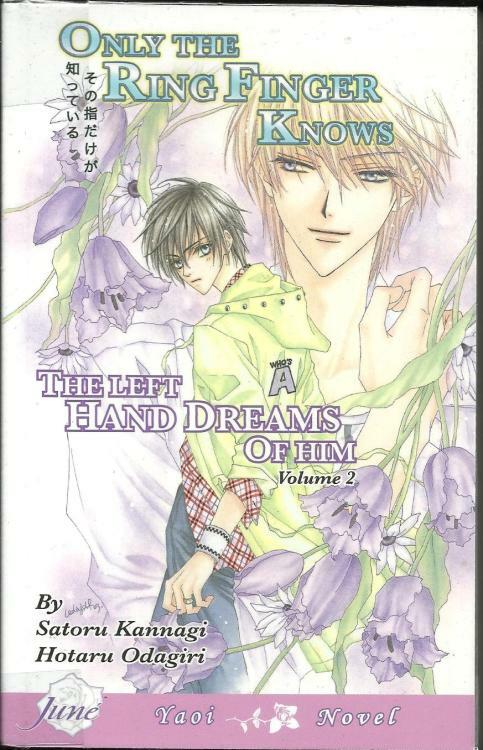 Same with the first volume, there are two arcs: The Left Hand Dreams of Him and Eternity of Palm. Kazuki and Wataru are enjoying their sweet time together. But everything turns rocky when they are faced with reality. Now that Kazuki is in university, Wataru is becoming more wary of their surroundings and his feelings. He also sees a different side of Kazuki he hasn’t seen before. The relationship of the two has gotten better than before. Wataru matures a lot. Kazuki… well, same as ever. Still the ever-dazzling prince in everyone’s eyes. That is repeated ever since volume 1 that I’m getting tired of it. Like, seriously, do you have to repeat how his good-looking features attract the girls anywhere he goes? Wataru’s confidence in their relationship turns shaky upon realizing the gap between him and Kazuki. Enter Asaka Masanobu, Kazuki’s senior in the university. At the same time, Asaka is like a superior of Kazuki in his part-time job. Asaka has the charm that doesn’t only enchant Wataru (to Kazuki’s irritation xD) but for me as a reader as well. He has a calming presence which makes him suitable as a mediator between the couple. He serves as a confidante of Wataru which serves for the good and bad of the pair. While he does seem to be a temporary supporting character, his constant appearance and meddling with their relationship make me think of what you might perhaps guess already. I am just crossing my fingers that when that time comes, Asaka won’t give me any reason to hate him. I don’t want to dislike this character. There is another character that volume 2 introduces. The second character is the infamous older brother of Yuiichi, Kazuki Shohei. He has been mentioned throughout the book, only to make his appearance in the second arc. He appears to be the major hindrance in his brother’s relationship. I remember reading somewhere before that Shohei, if not for his family, would make a good seme. The ultimate seme. www The appearance of Shohei is bad for the couple but good for the story. We already know the bad news so let’s go to the good one. Compared to other characters introduced before, even Asaka, Shohei is very much against to their relationship. It is understandable from his point of view that the image of his younger brother is at stake when his relationship becomes known to the public. The older Kazuki is the representation of the society, which is more prejudiced than he is. Volume 2 falls short in terms of tension building. When you think that the plot gets thick, it ends abruptly leaving you hanging. Some parts of the story are difficult to read because there aren’t spaces when shifting scenes. For example, you are thinking that they are still in Location A when the next paragraph they are in Location B. Worst case is, they have already jumped to another day with other characters. It is easy to confuse things when that happens. A simple spacing or line to break a scene wouldn’t hurt, right? It is nice to see my favorite couple again. Asaka and Shohei are a good addition to the cast. Yes, Shohei is a good addition because someone (finally!) bats an eyelash to their homosexual relationship. Too bad, there isn’t enough room for him to fully unleash his capabilities to stop the two. Let’s hope we’ll see more of the added characters in the succeeding volumes.